The Cuisinart C77SS-19P/C77SHP-3S is a combination of 19-piece knife block set with knife sharpener. 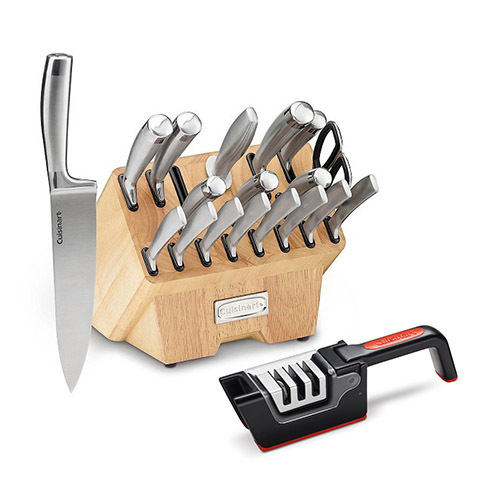 The C77SS-19P Block Set is a cutlery 19-piece block set. It's blades are made up of stainless steel material. The Cuisinart 19 Piece Cultery Block Set and Sharpening Station has many exciting features for users of all types. You can extend the lifetime of your Cuisinart 19 Piece Cultery Block Set and Sharpening Station with the purchase of a FactoryOutletStore Factory Protection Plan. 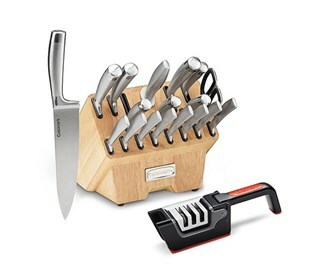 See the Cuisinart 19 Piece Cultery Block Set and Sharpening Station gallery images above for more product views. The Cuisinart 19 Piece Cultery Block Set and Sharpening Station is sold as a Brand New Unopened Item.